Jordan has a rich geological history, but even Jordanian geologist George Haddadin was stunned to discover caves dating back to the Stone Age, quietly sitting underneath a plot of land that was left for him by his great grandparents. Haddadin excitedly said in an interview with Roya that he discovered the caves while digging into the piece of land where he’d been planning to build a house. He knew that he had to dig deeper after spotting a ladder buried underground. 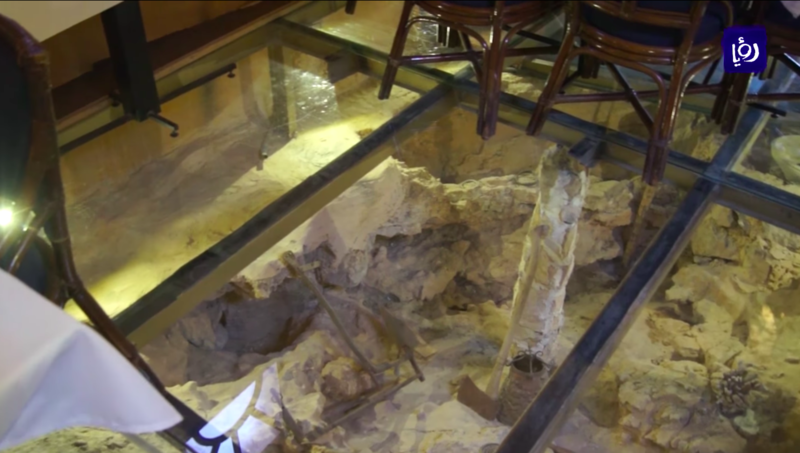 After unearthing the “national heritage,” Haddadin spent ten years transforming the caves into a restaurant, which today welcomes visitors from all over the place and even offers complimentary meals, with a side serving of history. Haddadin told Roya that he is looking to promote his restaurant so that more Jordanians and tourists can learn about its unique history, such as learning about the civilizations that lived there through the ages. Located in Madaba, Haddadin said that the lower caves date back to 65 million years, while the upper caves are 10,000-years-old. Those who visited the unusual venue were mesmerized to see the careful way Haddadin went about preserving the caves’ walls and interior. The lower and upper caves are separated by glass floors/ceilings, while the tables are also made out of glass, allowing visitors to see every part of the ages-old rocks at all times. The restaurant is called “Marah Salameh.” To Jordanians, the word “marah” means a place that is spacious. Meanwhile, Salameh is the name of Haddadin's late father. Haddadin’s significant discovery makes one wonder how many more similar caves are still undiscovered in Jordan? It also brings the important question to mind: why isn’t the Ministry of Tourism and Antiquities investing more money in excavation works?